I know you have been there. You have 2-3 overripe bananas and your thinking, banana bread or banana muffins, again. Well, not this time. 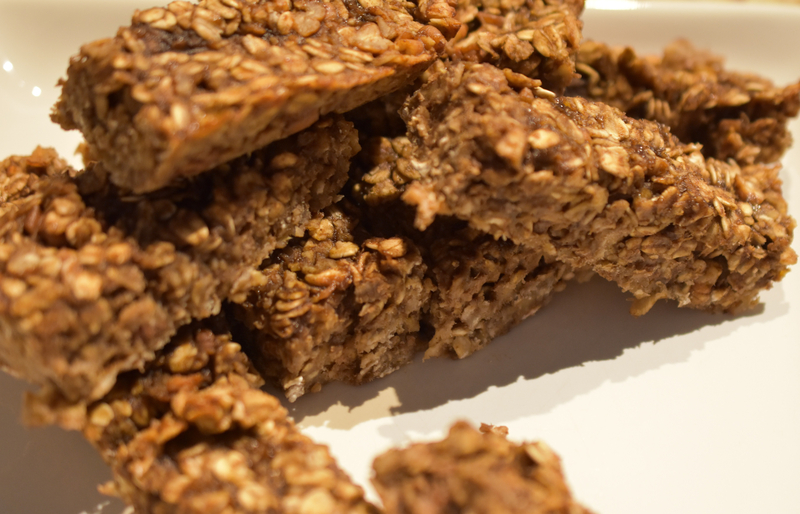 These breakfast bars can be made and everything cleaned up in under 30 minutes. they will last 5 days in the refrigerator when stored in an airtight container. These are great for those grab and go mornings. There is a secret ingredient that will revolutionize your healthful baking. Vanilla Cashew Frosting. Yes, you read the right – Frosting. The frosting is made of cashews, dates, vanilla and water. In a large bowl blend together bananas and cashew frosting until creamy and combined. Mix in oats, pecans, cinnamon, nutmeg, ginger and sea salt. Spoon oat mixture into 8X8 baking dish. Bake for 20-25 minutes.This depends on how chewy you want them to be. Cool and slice into 10 bars. Thank you. They are and they have been great for a quick grab n go snack lately. These look delicious! And you’re right, it’s nice to have something try something different with bananas. Thank you. Everyone needs a little variety. thanks for stopping by.